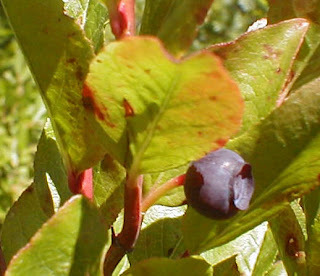 the "That Really Bothers Me" blog: Huckleberries Cont. Bearing in mind I am talking about Virginia, and that if you attempt this in another area, your results may vary: How does one go about finding huckleberries? It seems that first you want to find a hardwood forest that has been been around for decades, then search a portion of those woods that definitely has an understory of vegetation. Some forests will be too mature or, for some other reason unclear to me, just not support an understory. But where you find an understory, there amongst the small to medium size bushes you'll have a chance to find huckleberries. As Marsha remembers for her childhood blackberry picking days, wearing long pants, long sleeves, and boots is pretty much what you'll want to do. If it's hot and steamy, you'll be tempted to wear shorts and sneakers, but you need more protection than that from insects and briers. I'd look for poison ivy, and if your plot seems to have a bunch of it, you might want to pass it over for somewhere better. Actually, I think it can be easily avoided anywhere there are huckleberries, the poison ivy seems to be rare in an authentic older natural setting. The vile vine really seems to follow human activity around, no kidding. I especially notice if there has been mowing in an area, poison ivy will show up in the regrowth and amongst the understory nearby. No human activity nearby will probably mean little or no poison ivy. So, how to recognize the quarry? I pulled out my Peterson Field Guide / Edible Wild Plants book. It says to look for "low to small shrubs. Leaves elliptical, short stalked, toothless or minutely toothed, " a description that is pretty useful and any of the rest not so much. Looking further in the guide, I'm thinking now that what we typically have only been calling huckleberries and deerberries could also include bilberries, juneberries, and serviceberries. This would explain why we were starting to conclude that there must be a bunch of huckleberry subspecies. For sure, the berries can be all sizes and any color from blue to black. Some are really tiny, and as is supposed to be the case with huckleberries (apparently) never as big as what you see in the store. One would have to be an expert to recognize for certain all these berries we have been picking; even the Peterson guide is not enough. The good news is that one thing distinguishes these morsels, and is readily identifiable, is the way the remnant of the flower is recognizable at the end of the berry as in the store-bought blueberry. The Peterson calls this calyx lobes. If you are out picking and see them on the end of your berry, it will definitely make you recall the store-bought blueberries. You have an edible berry on your hands, pick it! Which brings us to the next question, would it be possible to pick a poison berry by accident? The Peterson is always careful to show what to avoid, and only warns against the Buckthorn. This plant too can have elliptical leaves, so potentially you could get confused, but we have had no problems. I have come across what I think are these berries, and as the guide says, they taste bitter, so you can do a quick test and spit it out. But mainly they are easily avoided because although the right size they do not look right, they do not have the calyx lobes and this is just something that can be spotted instantly. I have picked enough of these huckleberries now that I know in just a fraction of a second that I have the right berry, it really is that easy. Not to worry, newbies catch on fast. Finally, this brings up the question of who should pick the berries. Frankly, I don't think small children should even try, not because they might pick the wrong thing, but honestly the whole picture of getting up early, braving bugs and briers, having to hunt sometimes pretty hard; these things would be a problem. More mature kids, if they want to go, could pull it off in some cases. If you had any doubts, the cook or the person getting the berries ready for the cook can check out what's been picked at the necessary stage of going over the batch. This'll get rid of misc. leaves and stems that have been collected and makes a final quick double-check that all the berries look right. Stay tuned for one more post regarding a development I'm following, which will explain why operations could move to Maryland. Perhaps we can keep scofflaw Matt out of the hoosegow, too!